So, what exactly was the point of the Renewal of Baptismal Promises in the Easter Vigil? All modern commentaries concur that it is “very important” to renew liturgically our baptismal vows, but it is remarkable that not a single valid reason has been adduced as to why – which is hardly surprising, since there was no need for it in the first place, as Dom Capelle had stated. So, in the absence of a reason, a rationale had to be invented. 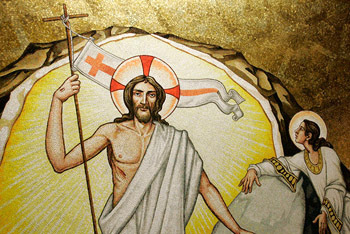 The clear implication of these words is that the true meaning of the Easter Vigil had been obscured and mutilated in the liturgy since the time of the first Christians – and it would be the task of the Commission to bring the Church back to those early centuries. Quite apart from the insinuation that the Church’s ceremonies, prayers, readings and chants for Holy Saturday had been deficient, even moribund, for over 1600 years, these words, written in 1953, reveal something more sinister about the Commission. Here we can discern the dim outline of that hermeneutic of discontinuity with Tradition that was being planned, whereby the very forms used from generation to generation were judged to be dispensable. Thus, the radical reconstruction of the Easter Vigil and the abolition of some of its ceremonies were the precondition for that control-by-committee, which would be the hallmark of all future developments in the liturgy. 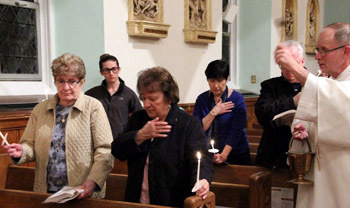 In all the preceding centuries, the Easter Vigil was regarded as the culmination of Lent, a long period in which the faithful focused intensely on sin, penance and personal conversion as a preparation for the spiritual renewal associated with Easter. This is why the custom arose of making a “good Confession” on Holy Saturday evening. The main point of the Easter Vigil was, therefore, always understood to be a penitential preparation for receiving the graces of Christ’s Resurrection. 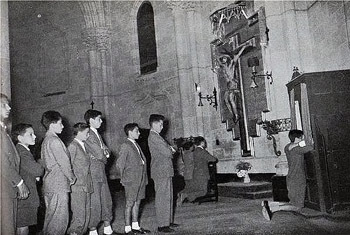 Before the 1956 reforms, long lines of penitents were a familiar sight in every church on Holy Saturday evening, and priests devoted 6 or 7 hours to hearing their confessions, sometimes until midnight. Changing the Easter Vigil ceremonies to the evening hours, therefore, gave rise to a major problem of the Commission’s own making: how to stem the great influx of people into the churches for Confession on the holiest night of the year. What exposes the hollowness of his principles is the fact that he was even prepared to leave the majority of penitents stranded without Confession, as priests would no longer be available to minister to them. What is “pastoral” about preventing people from accessing the Sacrament of Confession at a time that was most convenient for them? So much for the “pastoral” concern behind the reform. Fr. Löw airily dismissed the problem on the grounds that “through proper instruction and training of the faithful” they would be made to accept the new ways. But what about the Sacrament of Penance which, according to Tradition, was considered the optimal means of preparing for Holy Communion at Easter? It was totally eclipsed by a mere novelty, the Renewal of Baptismal Promises; and its importance was diminished in the eyes of priests and faithful by being relegated to a random sometime/anytime framework. Once again, as we have so often observed, a living bond connecting the faithful to their past was dangerously frayed. A notable example was the blessing of homes by the parish priest on Holy Saturday evening. This was done on that particular night of the liturgical year in memory of the Old Testament “Passover” or passing of the angel in Egypt and the signing of the door-posts with the blood of the sacrificial lamb. In spite of its biblical symbolism and the obvious analogy with the true Paschal Lamb whose death enabled mankind to “pass over” from death to eternal life, the Instruction accompanying Maxima Redemptionis (1955) ordered it to be carried out on any day except Holy Saturday evening. (9) Thus, the intrinsic significance of this custom was destroyed. Fr Joseph Löw, ‘We must celebrate the Easter night,’ Worship, March 1953, pp. 7, 10, 11. After the Blessing of the Font, the rubrics state: Si aderunt baptizandi, eos baptizet more consueto (If there are any candidates for baptism, let him [the priest] baptize them in the customary manner). 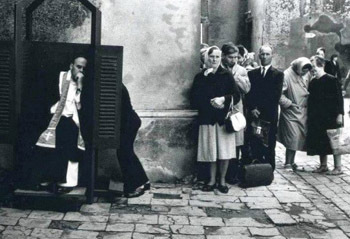 “Studeat parochus fidelibus suadere … ad confessiones … in diversis diebus distributis.” (The parish priest must advise the faithful coming to Confession [on Holy Saturday evening] to do so on any other days”). Sacred Congregation of Rites, AAS, 11 January 1952, p. 52. Fr. Joseph Löw, ‘We must celebrate the Easter night,’ p. 5. La Maison-Dieu, n. 47-48, 1956, p. 238. AAS 47, 1955, p. 847.